Juliana Farris Mazurkewicz of Texas posted a photo to Facebook on January 27 and claimed it was taken at her daughter's daycare. 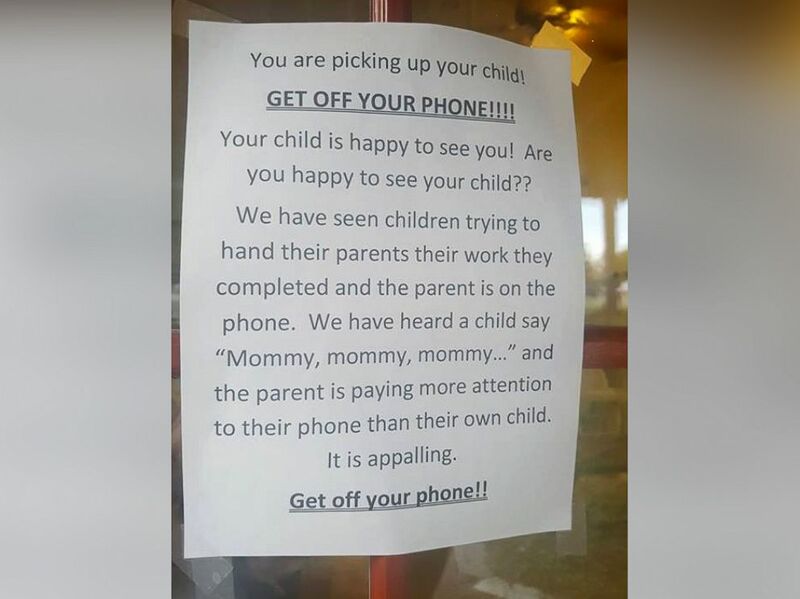 It's a photo that has touched a major nerve among parents and has been shared more than 1 million times. Add Parenting as an interest to stay up to date on the latest Parenting news, video, and analysis from ABC News. On Jan. 27, Juliana Farris Mazurkewicz posted the photo below to her Facebook page. The Hockley, Texas, mom captioned it "Posted at the daycare today!" Juliana Farris Mazurkewicz of Texas posted this photo to Facebook on January 27 and claimed it was taken at her daughter's daycare. She and her husband, Jason Mazurkewicz, told ABC News the photo was taken at their daughter's child care center. "The owner posted the sign on the door," she said. "I was surprised that they would be so bold, but also I liked it. I thought it was on point," she told ABC News. Another parent, Coley Sloan Jones, has a stepchild at the day care. She had a similar reaction. "I thought it was a valid reminder to parents to be aware and attentive to their child or children," she told ABC News. "Sometimes other things can wait, including a phone call." She said she does think there can be exceptions. Of the more than 7,000 comments on Juliana Farris Mazurkewicz's post, many were in agreement. But some took issue with the delivery. "I am appalled that a day care would post this. I agree fully with the statement but abhor shaming," commented Vicki Hagen Michel. "If this kind of shaming is done publicly, I hate to think of what happens to the children in their care." Mazurkewicz said she thinks the comments have been equal on both sides of the argument. "There's a big divide in the comments. Half the people are saying it's not the day care's business what paying customers do, and the other half are saying that it's great they are looking after the children's well-being." Some are taking a closer look at their phone habits, it seems. "There are a few that have said, 'I need to work on this,'" Mazurkewicz said, "which I think is pretty cool."